Trek’s Remedy model often overshadows its rowdier stable mate, the Slash. Perhaps that's because the Remedy is so capable in its own right. 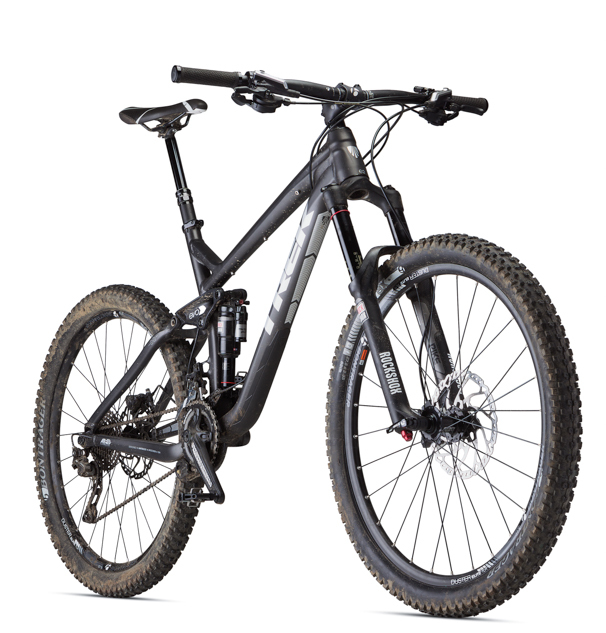 Trek's Slash, however, takes that ability to brawl up a solid notch or two, with 6.3 inches of rear suspension, a more gravity-oriented geometry and both a stouter frame and parts pick. The Slash utilizes the same fundamental walking-beam suspension system Trek has been honing for years now, and it's decked out in an assortment of Trek proprietary frame technologies including the Active Braking Pivot (designed to keep the rear suspension supple under braking), Full Floater shock mount, the stiff, one-piece EVO rocker link, and the Mino Link (a flip-chip that lets you slacken the head and seat tube angles a half-degree while also dropping the bottom bracket from 14.13 to 13.78 inches). The Slash 8 is outfitted with a smart mix of mechanical bling with a few affordable bits tucked in. Highlights here include the RockShox Reverb Stealth dropper post, adjustable-travel RockShox Pike RC fork, E-Thirteen chainguide, Shimano SLX brakes and SLX/XT shifter and rear derailleur combination. The Slash 8 doesn't rip up hills the way, say, Ibis' Mojo HD3 does, but if you soldier along in the saddle, it's more than a fair climber. The Slash 8 also provides stellar traction on rocky ascents–the best of the bunch, really. Out of the saddle efforts, however, plunge the Monarch Plus R DebonAir rear shock deeper into its travel. Aggressive climbers who dance on the pedals will find themselves pining for a rear shock with a lock-out lever. Our 19.5-inch test bike sports a 24-inch toptube and while it'd be a stretch to call that short, it is a half-inch or more snugger than some similarly sized bikes in this class. Bicycle fit is always a personal matter, so take this criticism with a grain of salt, but I found myself wishing the Slash's cockpit was a bit longer. Plenty of riders would probably disagree with me. Try a Slash for yourself. The Slash 8 has a sturdy, planted feel to it. Usually that's just a gentle way of saying a bike handles like a tank, but that's not true here. The Slash 8 feels burly in a good way. While the Trek boasts a hair more rear suspension travel than the other rigs in this review, it feels like boatloads more. Small trail chatter vanishes beneath the bike and when it came to dispatching those big, wrist-breaker hits, the Slash 8 simply trounces most bikes in its category.